Everybody can run. But how to run correctly to lose weight not everyone knows. Some people have no extra time to go to the gym or park they bring some home gym equipment like treadmill portable dip bar or rowing machine. Let’s find out: how to lose those extra pounds with the help of jogging for weight loss, without harming your health. Running for weight loss is a regular run during which our skinny muscles and limbs perform very complex coordinated movements. The body spends a huge amount of energy, metabolism improves, the circulatory system is saturated with oxygen. This all contributes to the good work of all organs and tissues, and as a result – you are provided with weight loss. First of all, you need to set a goal: to lose weight and be patient! You will have to do daily runs. Get a charge of positive energy for the whole day. Run with pleasure and without compulsion for at least 1 hour. Neck, shoulders, arms should be relaxed and back straight. Try not to run on asphalt or concrete paths. Breathing should be uniform: inhale and exhale through the nose. Mouth breathing can trigger oxygen starvation. Before jogging for weight loss, do a light workout, stretching the muscles. Clothing for running should be made of natural fabric, lightweight and comfortable. Shoes should preferably be with a cushioned sole. To lose weight, you need to alternate fast running for a short distance with slow running for a long distance. This will lead to more burning of calories because the muscles will not get used to the same load. In the evening, you need to run two hours after eating, and in the morning – on an empty stomach. Before each run, it is very important to take a contrast shower to increase muscle tone. Water will prepare your body for physical exertion. After jogging, you must take a warm, relaxing shower. Before the morning run, do not forget to drink a glass of non-carbonated water. Do not forget that running for weight loss not only eliminates unnecessary kilograms but also improves your mood, brings pleasure, gives a feeling of cheerfulness and joy. How much you need to run to lose weight. To lose weight, you need to run not for a distance, but for a while. If you start to feel discomfort while jogging, there is a heaviness in the muscles and it is hard for you to breathe, stop and note the time. Take a walk and normalize breathing. The next day, make the race 5-10 minutes longer. You need to run at an average pace and preferably in hilly areas. On it, you will have to accelerate or slow down the pace. Such a run for weight loss contributes to the acceleration of metabolic processes and more efficient fat burning. It is very important to practice regularly! Then your body will get used to the loads, muscle pains will go away and fat accumulations will be burned more actively. Before you start jogging to lose weight, you need to find out how much you need to run to lose weight? The table will help you figure it out. Do not forget that this table is an approximate training program. Depending on gender, age, and physical fitness, you must individually choose how much you need to run to lose weight. Consultation of medical specialists is very important, as some methods of running for weight loss are contraindicated for people with heart disease, namely, interval running. The name speaks for itself – interval running for weight loss is a run with alternating speed. For example brisk walking gives way to an easy run, and then goes into the fastest possible run to the limit of its capabilities and again easy running and walking. Interval running is considered the best for losing weight. The alternation of the pace of movement causes more significant changes in the body. And this happens because when you run a short distance to the limit and then slow down, energy continues to be consumed as well as under a heavy load. The body, by inertia, continues to maintain a very high level of metabolism (metabolic process) and burn fat cells at both fast and slow distances. The word rest means easy jogging or walking. For 30 minutes of such training, you will spend as much energy as you would spend in an hour of easy running. If you have any health problems, consult your doctor. For interval running, you need to go for weight loss strictly after warming up the body. You have to eat right: in small portions but often – 5-6 times a day (split meals). It is very important to comply with sleep patterns. Interval running for weight loss can be practiced both outdoors and in the gym on a treadmill. Listen to these tips and lose weight on your health! Morning is the perfect time of the day for jogging for those people who are embarrassed by the passions of passers-by, for the full, for workaholics working until late. In the morning, few passers-by and cars. The air is clean and maximally saturated with oxygen. Inhaling while running to lose weight in the morning, the fresh morning air improves your cardiovascular and respiratory system. The best time to run in the morning from 6 to 7-30. Before jogging in the morning cannot eat breakfast. Drink a glass of pure non-carbonated water or warm sweet tea with lemon. Sharp stops while running for weight loss cannot be done. If you are tired, replace the run by walking. Use interval running for weight loss in the morning. Take a douche before running to lose weight. After a run takes a warm shower. Starting to do jogging for an untrained person to lose weight should be a little Gradually increase the load. Better to start with walking! Then alternate running with walking. The number of workouts for beginners should be -3 times a week. Tempo is average. The time interval is 10-15 minutes a day. After a week, add another 5 minutes to the workout, etc. Bring the total running time to 30 minutes. It is very important while running for weight loss to control your condition. Do not forget to measure the pulse before and after class. Before running, the pulse rate is 60 – 80 beats per minute. After the end – 120-130 beats per minute. For two weeks of running, muscle pain will disturb beginners to lose weight. Due to the gradual increase in load for beginners, weight loss becomes painless. After 30 minutes of jogging, the hormone of happiness, joy, and pleasure – endorphin – is secreted. You will feel for yourself how your mood rises and a feeling of cheerfulness appears. Sometimes due to bad weather conditions in the winter or cold rainy autumn, jogging does not work. That such training were regular experts designed a racetrack. 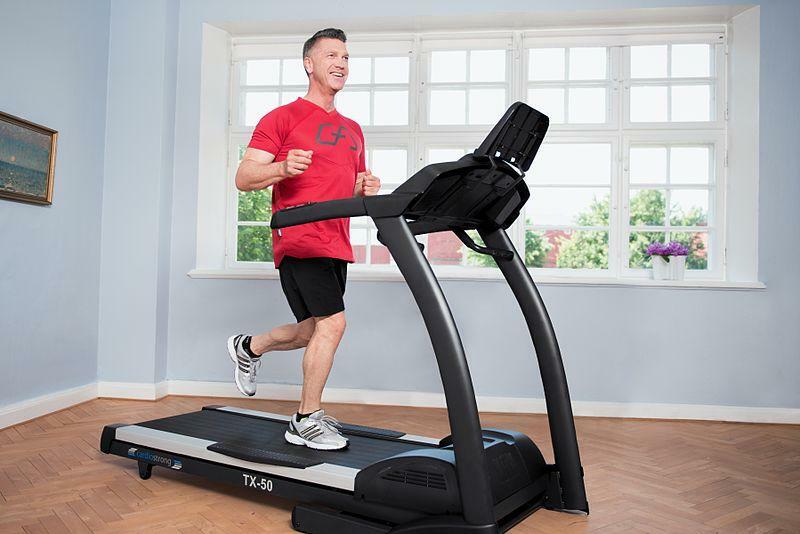 Treadmills are convenient because they can be installed at home and run for weight loss during the cold season. Do not forget: to the effect of running for weight loss was positive – you need to do it regularly. Electric treadmills have different training programs, the depreciation system, it pulls itself up and does some of the work for you. Each lesson begins with a 10-minute warm-up. It is very important to monitor the pulse rate. Most programs are based on keeping the pulse in a certain range. For example, a fat burning program is used for weight loss on a treadmill, when the speed of the track changes so that your heart rate is around 60-75% of the maximum. We specify the maximum heart rate – 190 beats per minute. You should spend most of your workout with a pulse of 133 beats per minute. Walking to warm up – 7-10 minutes. Running with acceleration. Switch speeds in 2 minutes – 7-10 minutes. Running with a maximum load — 5 minutes. Easy jogging then walking – 5-7 minutes. We have already found out that the treadmill can be installed at home in a well-ventilated room. Running at home for weight loss is quite real and convenient. Expose the treadmill program “walking through the hills” (the track angle changes to simulate the ascent and descent from the mountain), turn on the TV and enjoy running at home to lose weight. If you do not have the opportunity to buy a treadmill, and on the street is dirt and cold, and to run around a great desire, you can run at the place of the house for weight loss. Choose a room in the room near the wall. Lay a thick sports rug. Turn on cheerful music. Open the window. Walk 3-4 laps around the room to warm up. Then stand against the wall, palms lean on it at chest level, slightly bend your arms and tilt the body forward. It is in this position that the body should be in the process of running in place. Running on-site at home for weight loss can be combined with push-ups, swing press, stretch marks. Catching up on the run at home for weight loss you can lose 5 kilograms in one month on condition of moderate nutrition and regular workouts. Very often there is controversy. What is better for losing weight – running or walking? Let’s figure it out! During training and running and walking, the cardiovascular system, the musculoskeletal system are strengthened, endurance increases, metabolism is normalized and calories are burned. But the load on the body while walking is less than during running. Therefore, if you suffer from obesity, heart disease, spinal cord or you have sore joints – running is contraindicated. If you do not have any medical contraindications to running for weight loss and want to lose weight as soon as possible. You need to choose a run! If you chose jogging as a workout, then do not forget to follow the pulse – it should not exceed 120 -135 beats per minute. This is the best indicator for effective fat burning. Do not forget that alternation – walking – easy running – running with acceleration – walking contribute to the maximum fat burning and fast weight loss.